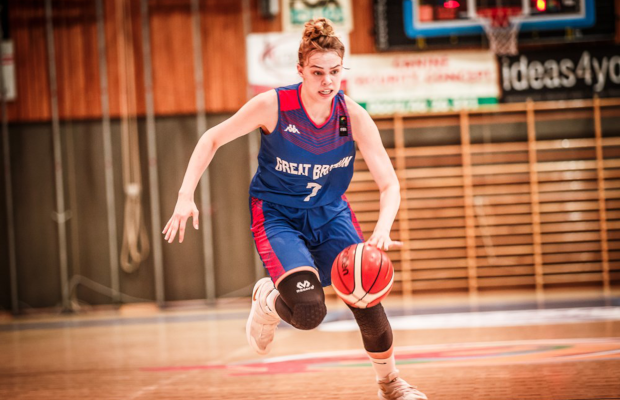 Great Britain Under-18s Women fell to a 66-59 loss against Turkey in their second game at the European Championships in Oberwart, on Saturday. GB saw their double-digit half-time cushion completely wiped out in the third, and were unable to recover down the stretch as they suffered their first loss. Holly Winterburn led the effort with 25 points along with seven rebounds and seven steals in the defeat, while Shauna Harrison had 11 points and four steals. GB edged the opening stages of the first quarter and finished with Winterburn netting a deep three at the buzzer to make it 18-11. The momentum continued into the second with Winterburn moving to 14 points to help GB into a 40-27 cushion at half-time. However, GB were outscored by 21 points in a pivotal third quarter as their opponents took charge. And-1’s from Winterburn and Harrison were rare bright points in a tough 10-minute spell as Turkey finished on a 20-1 run to take a 54-46 lead. GB stayed in contention in the fourth until Turkey netted back-to-back threes to take their advantage to 13 points at 64-51 ahead of the final two minutes as they went on to seal the win. GB face Montenegro at 2:45pm UK time tomorrow (Sunday) with Denmark the only unbeaten side in the group so far with the top two teams making the quarter-finals.